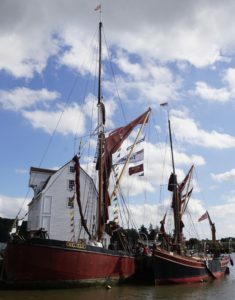 We’d been invited to join in with Maritime Woodbridge this year and set out from the Tidemill Yacht Harbour an hour before high water on Friday to motor round to the Town Quay. After running aground twice, and concerned about the fast approaching high water, we returned to our berth in the marina. On Saturday, we tried again. It looked like there would be more water in Bass’s Dock and we approached slowly, running aground again alongside the Dutch barge ‘Inez’, but there was plenty of time before high water, so we waited. 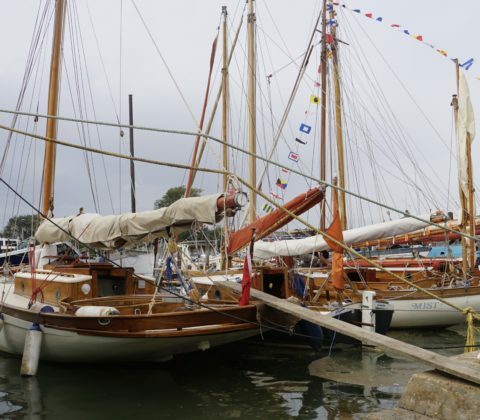 As the tide came up, we gradually warped our way into the dock stern to with several helping hands joining ‘Flooka’ and three Albert Strange yachts ‘Mist’, ‘Galatea’ and ‘Nirvana of Arklow’. 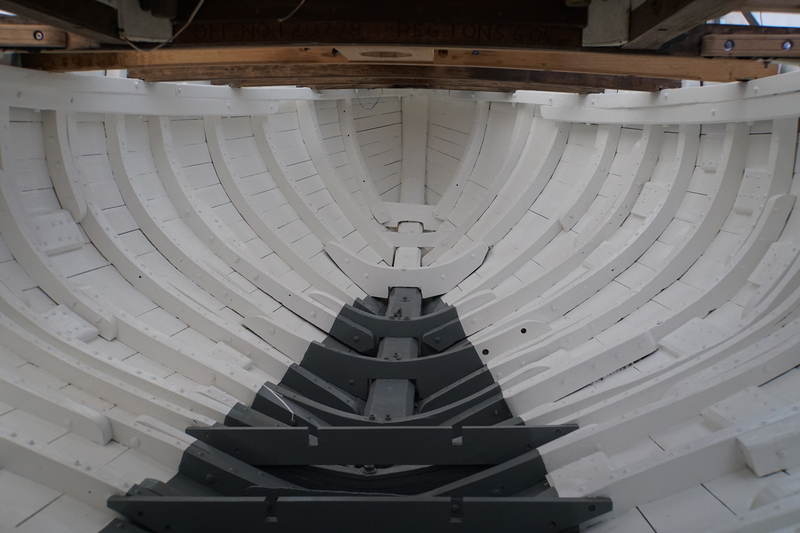 There were plenty of visitors braving our gang plank to come aboard, with lots of admiring comments for ‘Cachalot’. The event was held in the newly redeveloped Whisstocks Centre and seemed to be very successful with plenty going on. 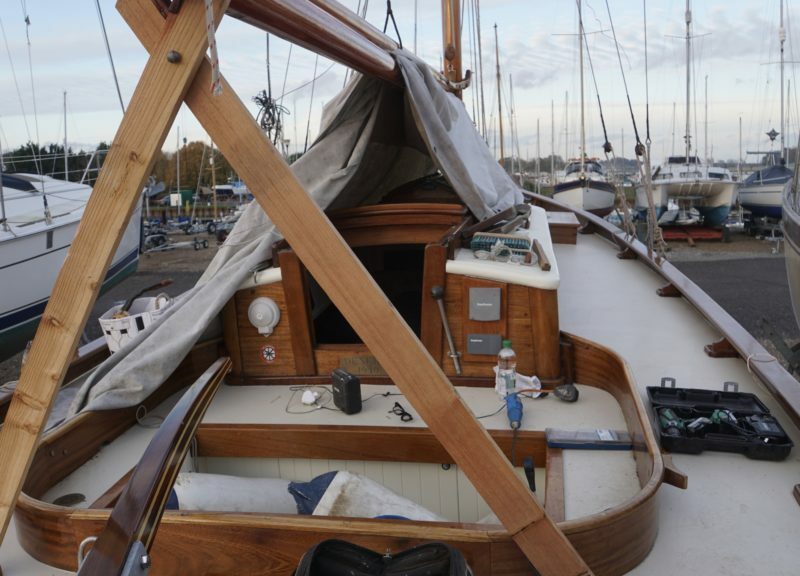 We hoisted the mainsail when OGA friends Pete and Clare came aboard . . . thanks for all the help and advice with rigging and reeving! 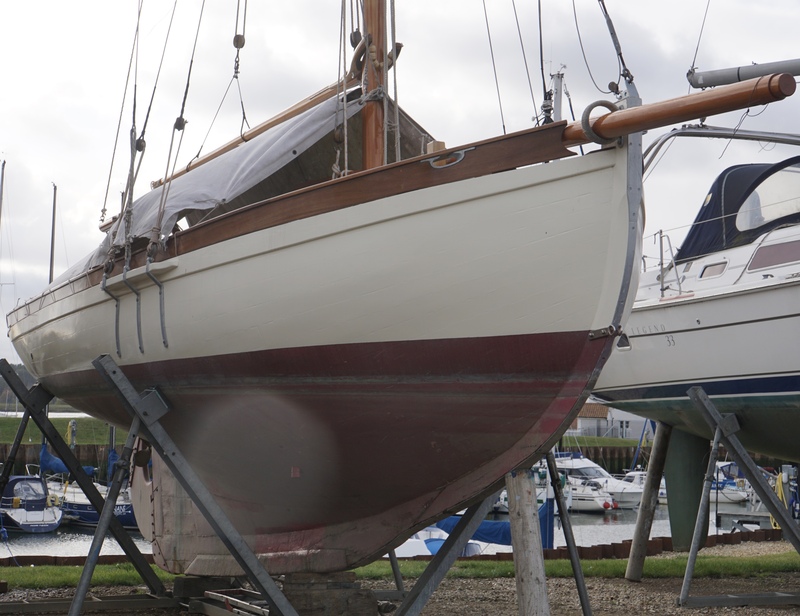 After a few days in Derbyshire, we’re back in Suffolk for the OGA Summer Cruise. 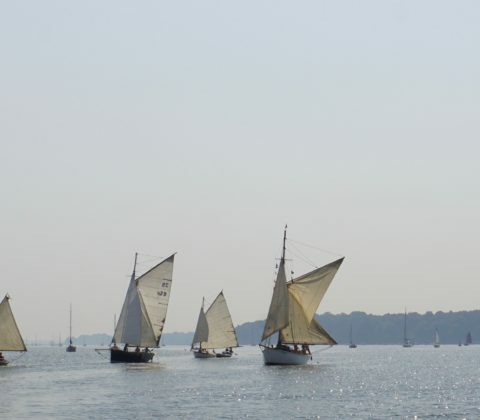 After a passage race on Friday, 20 July and the East Coast Race on the River Blackwater the following day, the week’s cruise ends with a parade of sail up the River Orwell today. 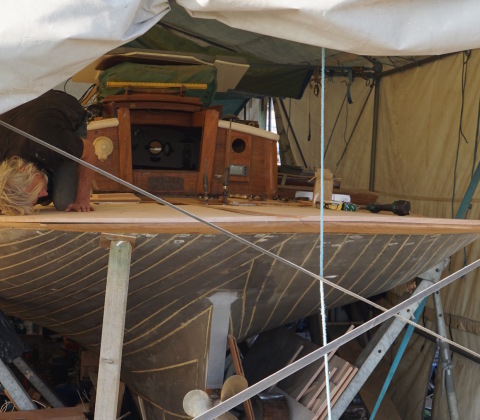 ‘Cachalot’ isn’t ready to take part, so Bev crews with James on ‘Kestrel’. 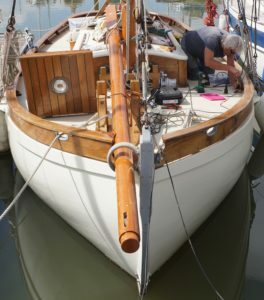 While Bev’s out sailing, Steve gets on with fitting out with evening trips to various locations to join the Gaffers by car. 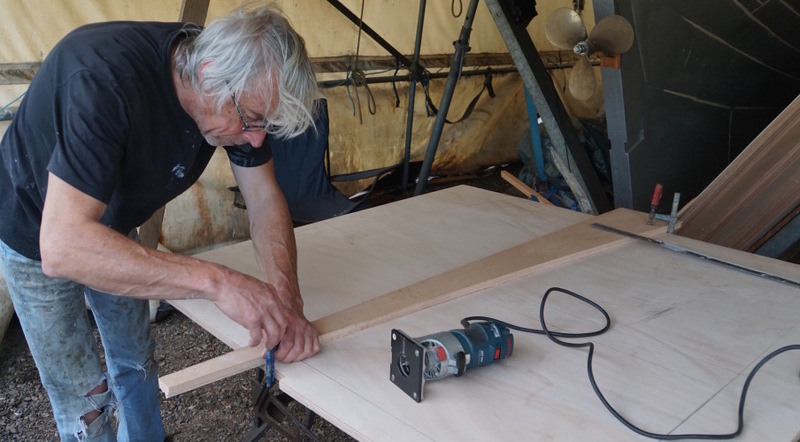 The work is made harder by the blistering heat and lack of shade, but he manages to to get a lot done including installing the VHF radio and navigation lights, setting up the Wykeham Martin jib furling gear, bobstay, bowsprit shrouds and anchor (without the newly-acquired winch, for now). 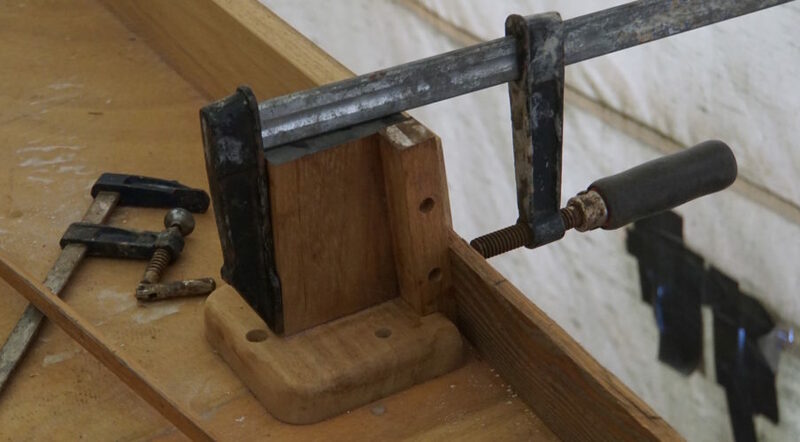 He spends an enjoyable couple of days with Steve, from Ratsey’s, who’s visiting the Tidemill YH on holiday from the Isle of Wight and also repairs another area of winter damage where the new capping rail has split. All these ‘little jobs’ take time, and it’s sometimes hard to see progress, despite ticking them off the list! One last trip down to Suffolk in November finds us staying with James for the weekend of the East Coast OGA AGM. 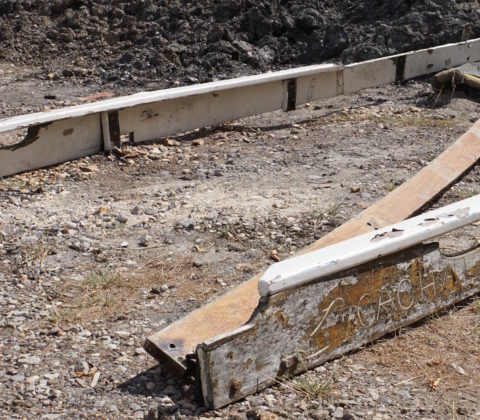 We check everything out for the winter, and hope that the old boom cover will afford sufficient protection against the weather until the spring. 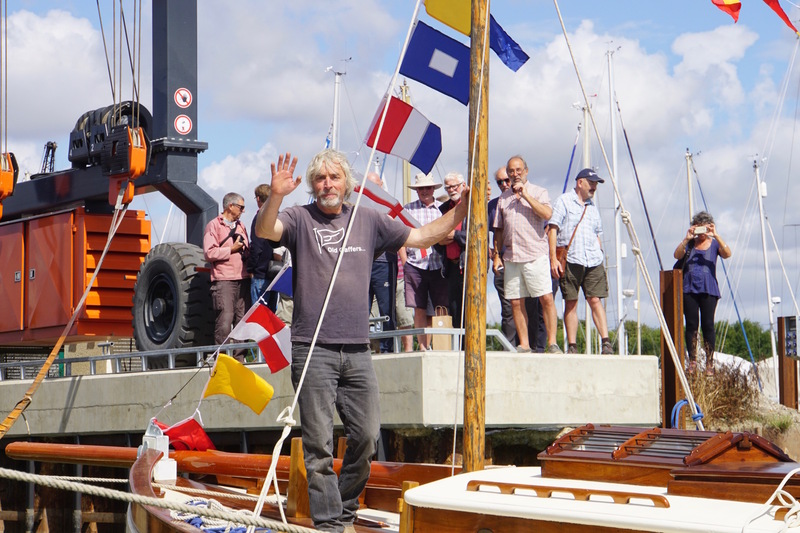 After the launch, the bilge pumps were set and timed regularly – it all seemed to be going OK so we went sailing with James on ‘Kestrel’ with the East Coast OGA, setting out from Waldringfield for the August Cruise to Brightlingsea on 11 August. 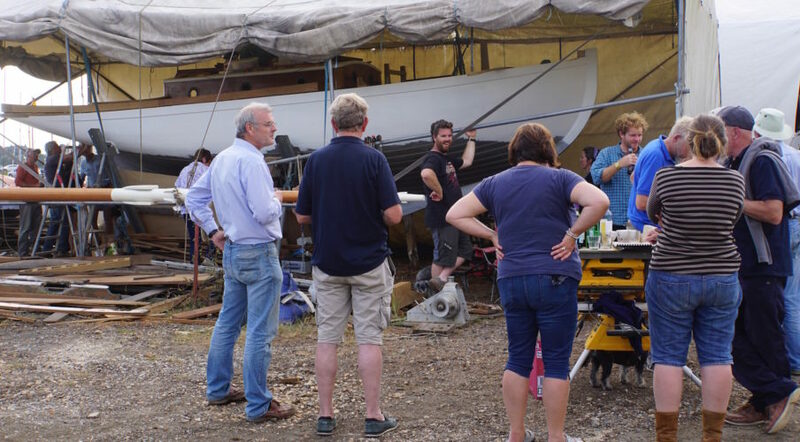 Andy agreed to keep a watchful eye on the bilge pumps, so Steve didn’t need to worry (much!) 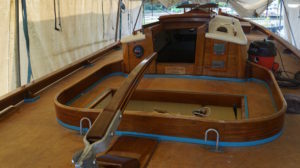 and could enjoy the sailing and a bit of relaxation for a week away . 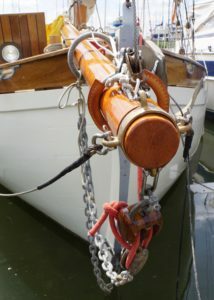 . .
On our return, the priority was to be the mast, but the bilge pumps were still running rather too frequently. 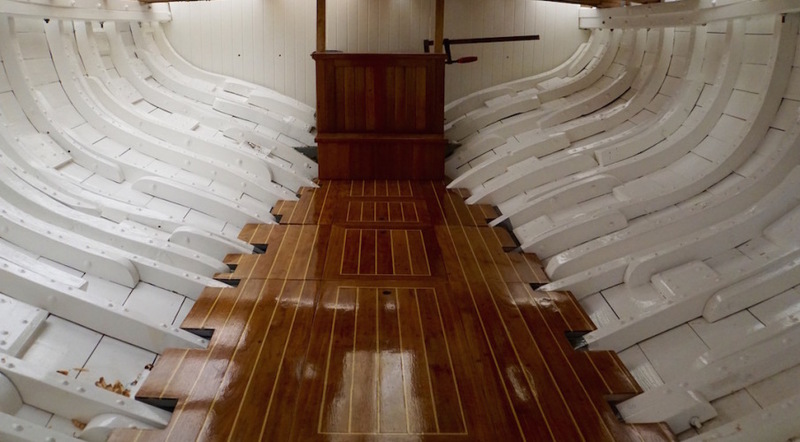 Reluctantly, it was agreed this was more than just ‘taking up’, despite all the old tricks of sawdust under the hull . . . she needed to come out for a better look below the waterline. 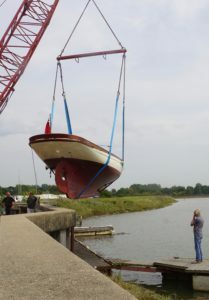 We could have had her lifted at the Tidemill, but a better option seemed to be the short motor up river to Larkmans, where James could have a look at her seams and do any work while she was left in the slings for 24 hours. The tides were just right, with high water around midday, so Steve motored up river on 23 August. 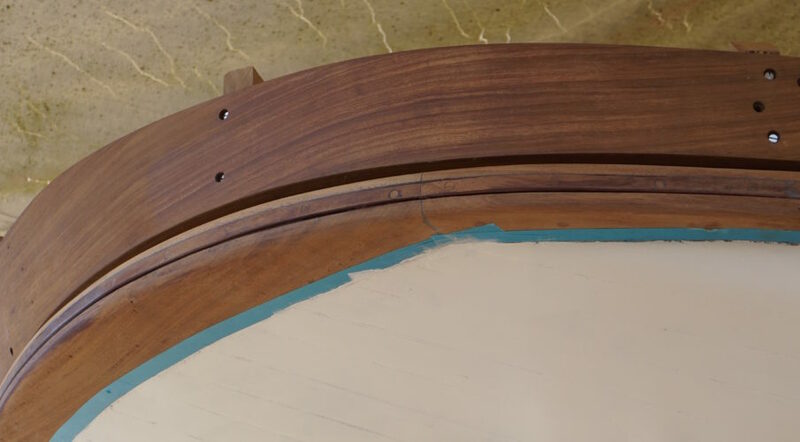 There’s still lots to do, but it’s not all work . 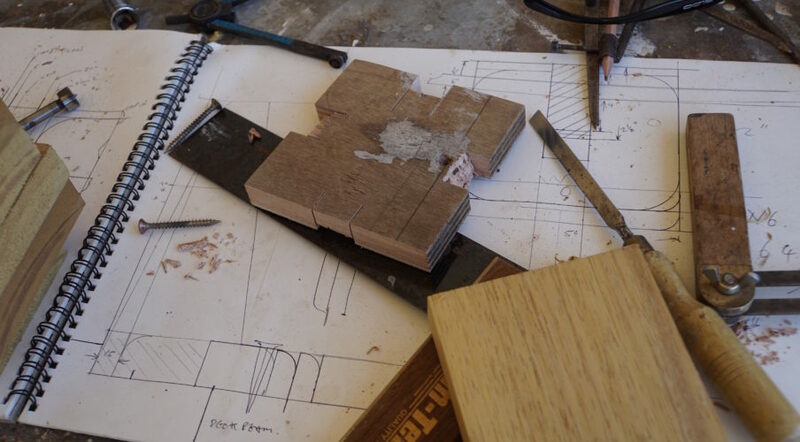 . .
Friday morning dawns, and there’s still lots to do. 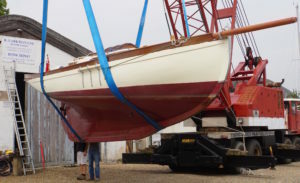 Yvonne arrives with the flags and the old bowsprit is taken round to the boat as a temporary mast to dress her overall. 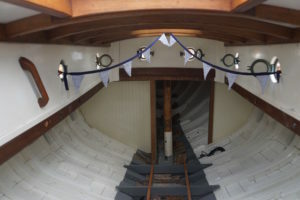 She also has bunting for the inside. 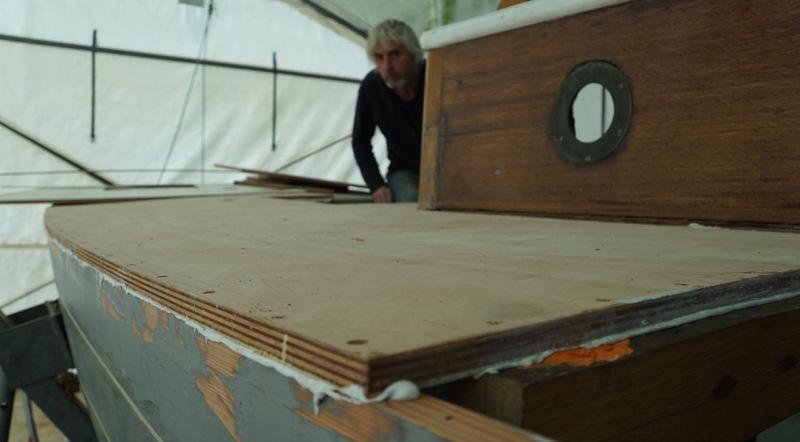 Chris has very kindly let us make use of his empty tent for storage since the launch of his boat a couple of weeks ago. He’s also happy for us to make use of it as a reception venue, so this is also dressed up and trestles laid out with drinks and nibbles. The launch is scheduled for around high water at 1050 and people begin to arrive as the preparations continue. It’s great to see so many people coming to help us celebrate. The party goes on all day, and into the evening with another musical gathering to round off the night. Throughout the day, we’ve also received messages from as far away as the Baltic and South West England – thankyou to everyone who’s supported and encouraged us on this rather long journey. 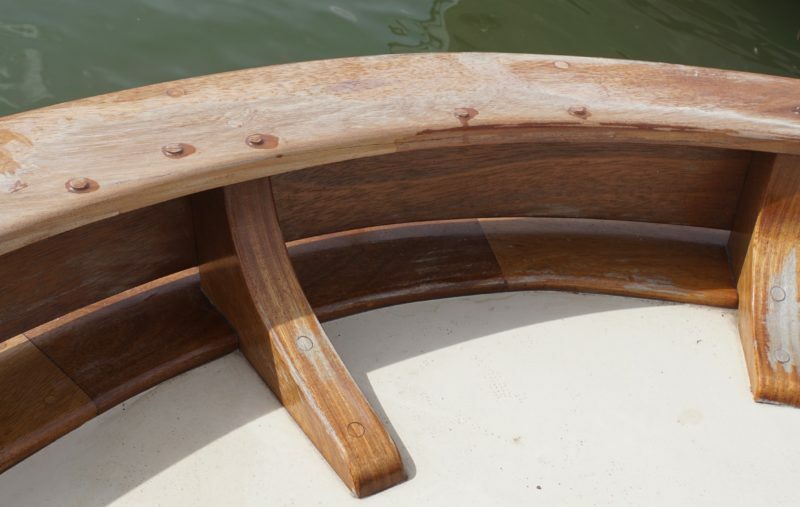 There’s still quite a lot to do before we get out on the water, so keep looking out for the next instalments of our story! 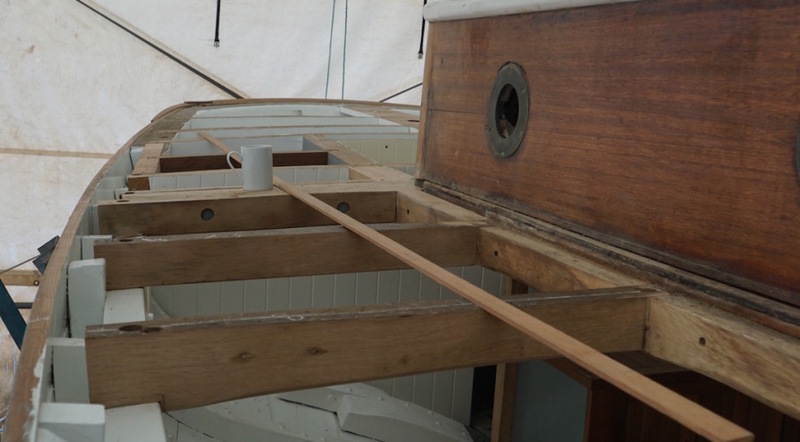 Deck fittings, coachroof and a cuppa on board! 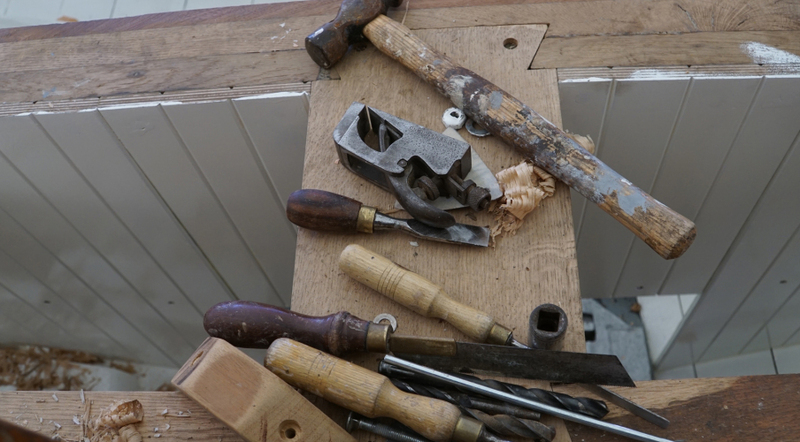 While we wait for the metalwork to be returned, there’s plenty more to do! 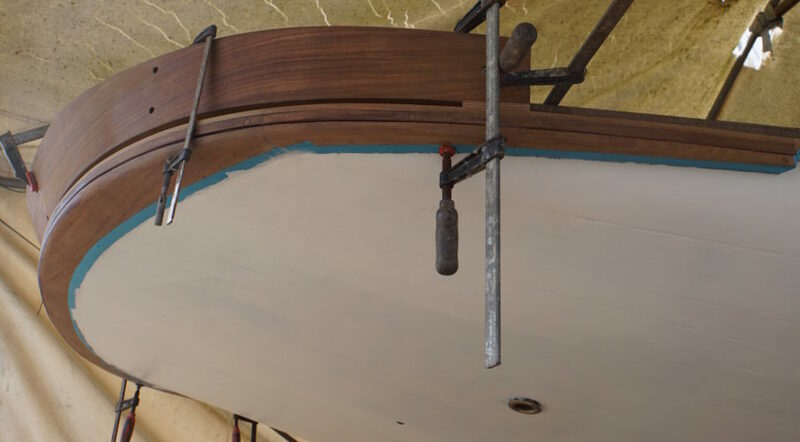 The long bolt is drilled, and secured just above the rudder stock and rings for the mainsheets are all secured through the deck. The big plastic box storing yards of tangled electrical cables is unpacked and instruments are checked, then fitted in place ready for the electrics to be re-installed. 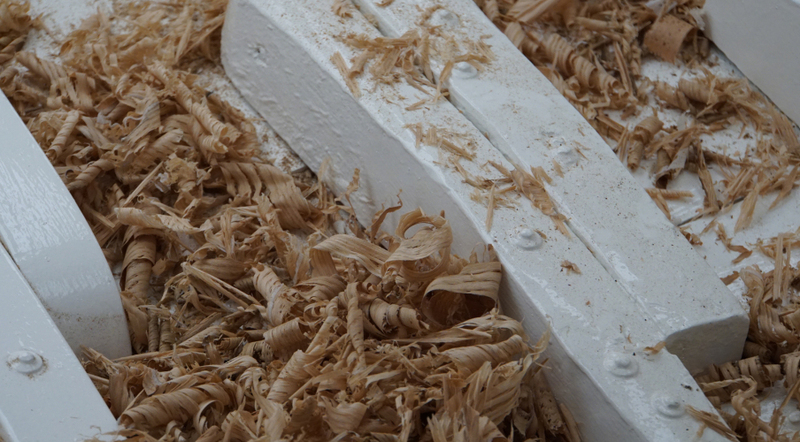 The bilge pumps, in particular, are scrutinised and cleaned up ready for service. Sadly, it seems the depth sounder hasn’t survived, so there’s quite a bit of research to source a replacement to be fitted before the launch. 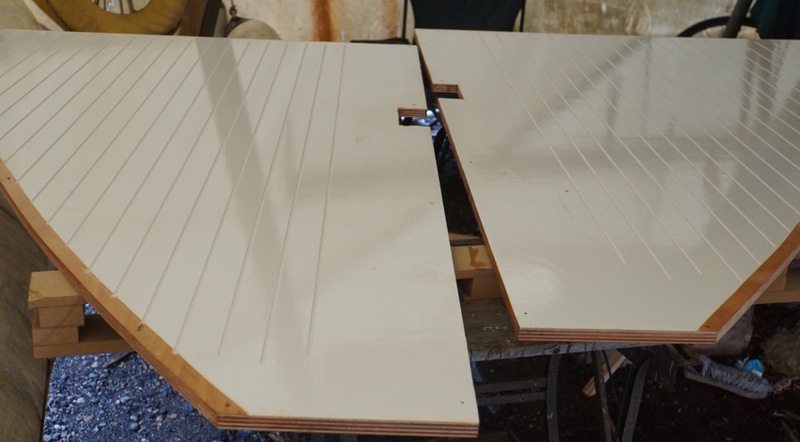 Steve will be returning to Derbyshire in the Bongo, via Birmingham to pick up Simon, and plans to get the deck painted with at least one coat before leaving on 14 July. The weather is kind, with a gentle drying breeze and no rain . . . 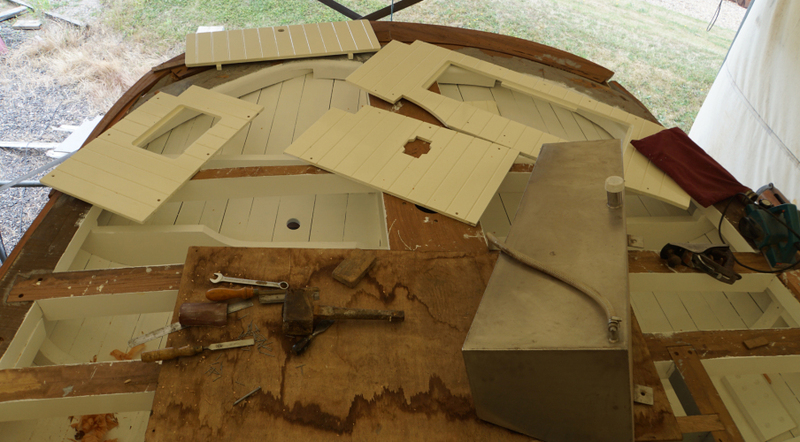 He plans each day allowing time for a few more coats of varnish and then gets the coachroof painted in Epifanes no. 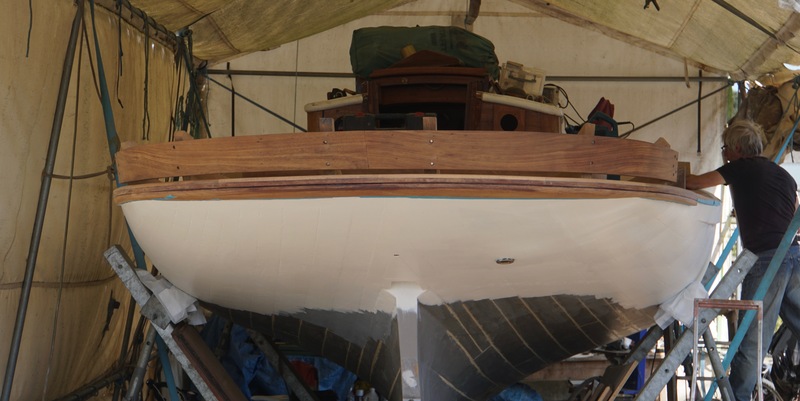 24 with non-slip pearls added, to match the hull. 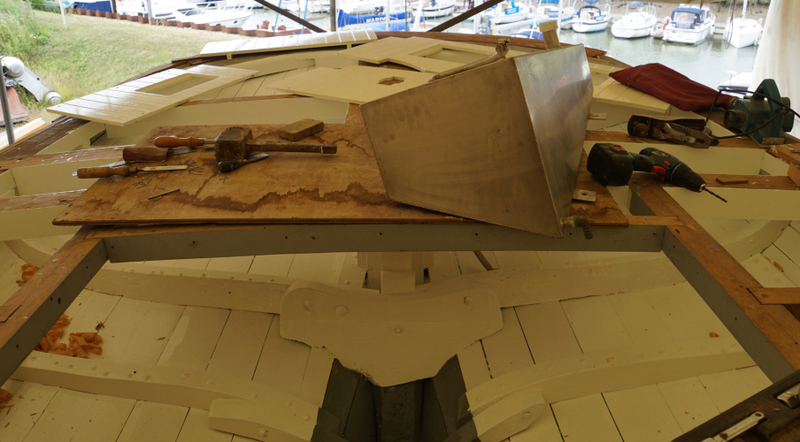 Before the chainplates can be fitted, due to the change in design, there’s six more frames to be fitted inside the hull – a piece of work unaccounted for in the list of ‘essential to do before launch’ list! 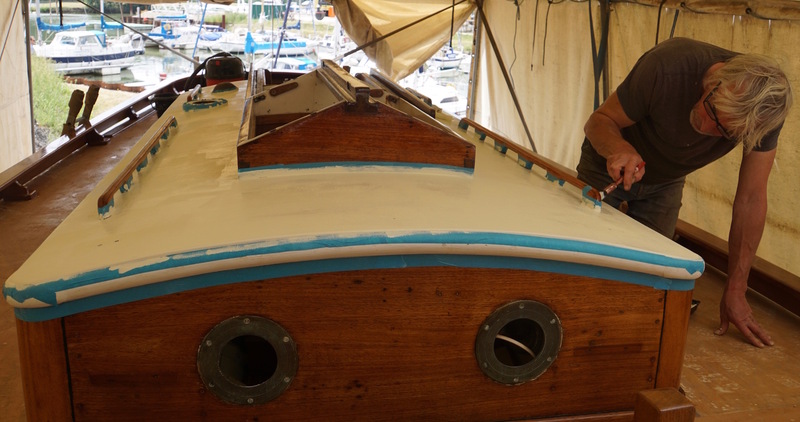 Bev sets to work masking up all the varnished areas in contact with the deck in preparation for painting. She takes the car back home on 10 July to get some more work done on the house before Simon and Steve return at the end of the week. We know Dutch OGA friends Rik and Celeste on ‘Cine Mara’ and Fred on ‘Morgaine’ are visiting the East Coast. 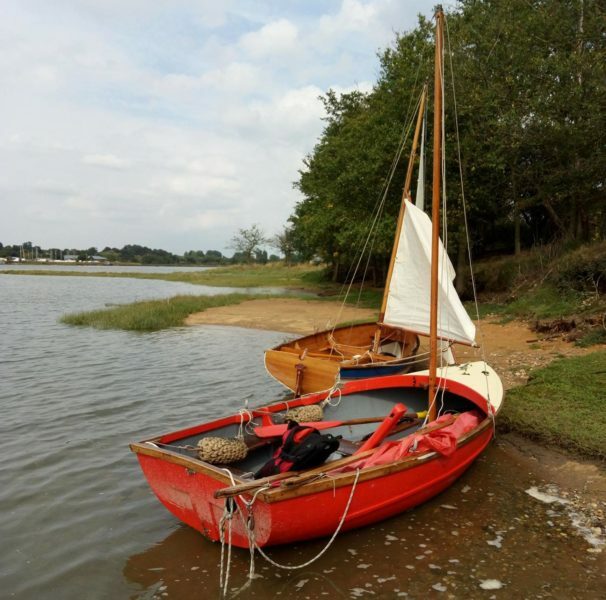 We track them down while they’re at anchor in the Deben, and invite them for a cuppa – our first visitors on board, even if she’s still in the tent on her cradle! 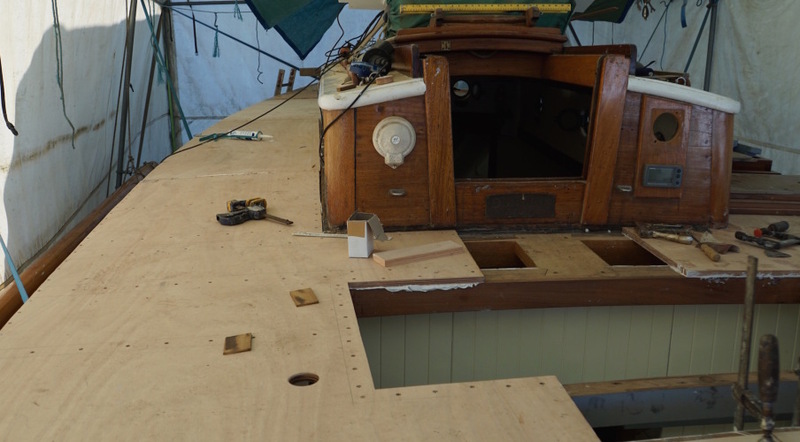 Once the counter bulwarks are in place, it's time to think about replacements for the port and starboard sides, and the capping rail. 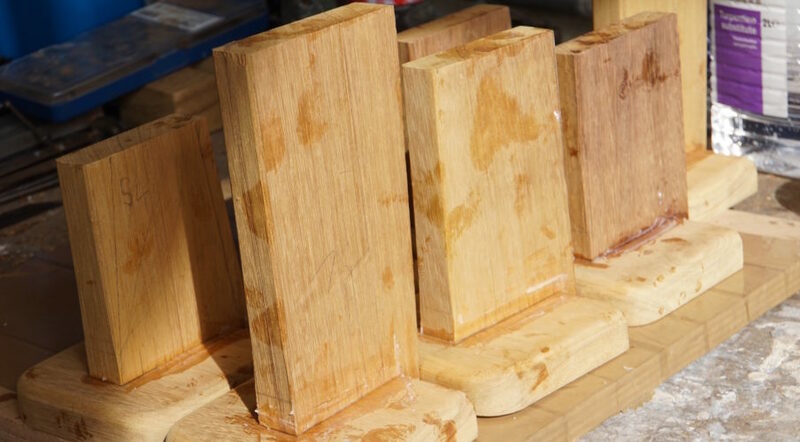 After careful measuring, a stock of iroko is purchased from Thorogoods, sufficient for the new bulwarks as well as the capping rail. It's all sticked up ready, beside the tent . 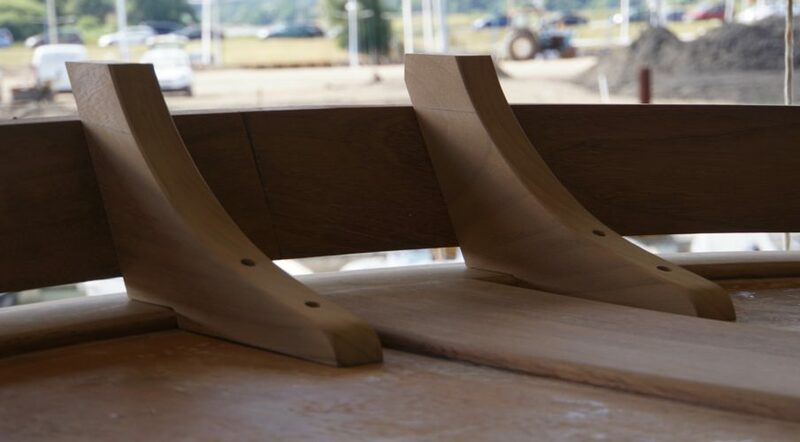 . . but what's the best way to secure the new bulwarks to the deck? 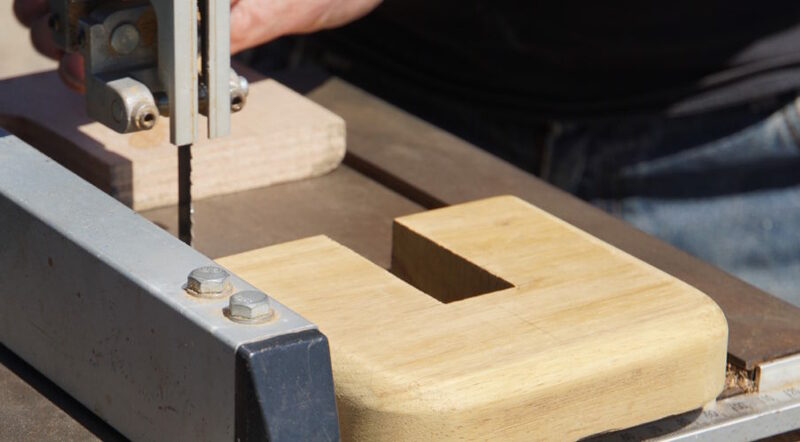 After much discussion, with various people, and several mock-ups and drawings, Steve starts production of 14 stanchions to sit neatly beneath the capping rail. 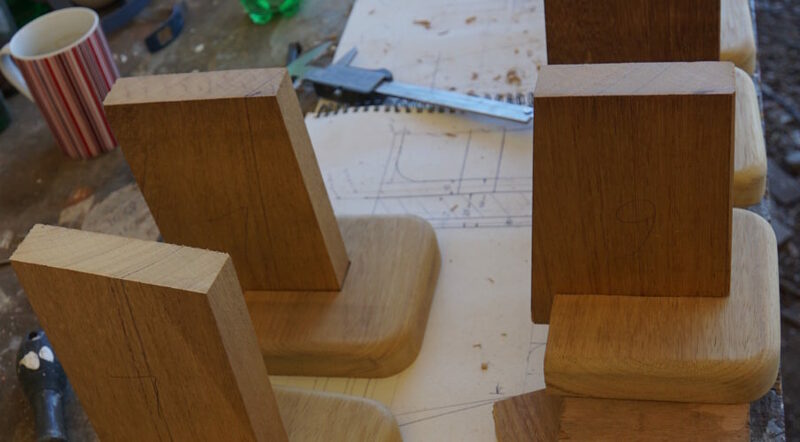 Making the stanchions takes quite a while, and was interrupted by a few days out sailing with the OGA for the August Cruise. 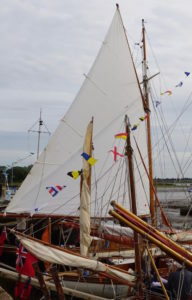 Bev sailed with James on 'Kestrel' for the whole week, and Steve spent most days working, joining the fleet for evening events ashore . . . 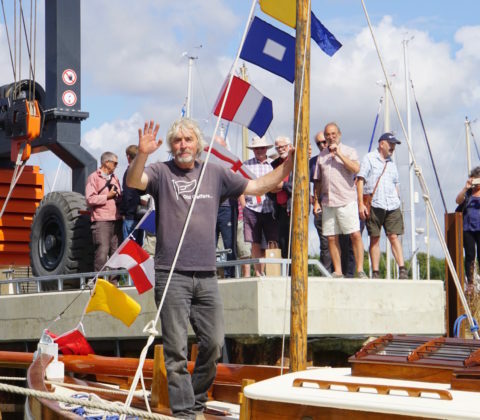 It was great to welcome a crowd of gaffers at the tent on 22 August though, even though she's not in the water, we kept our promise of beers a-plenty! 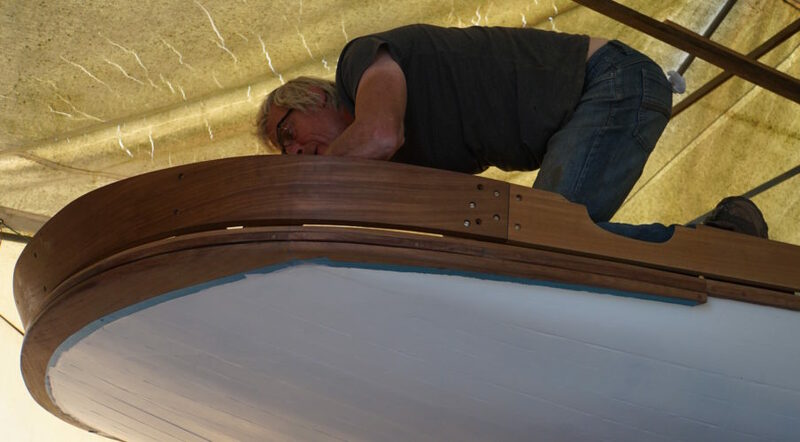 Bending on the iroko for the bulwarks went well, and by the beginning of September the deck was looking pretty shipshape - just needing the capping rail and enough good weather into the Autumn to allow us time to paint and varnish ready for winter. Gaffers arrive to check on progress! 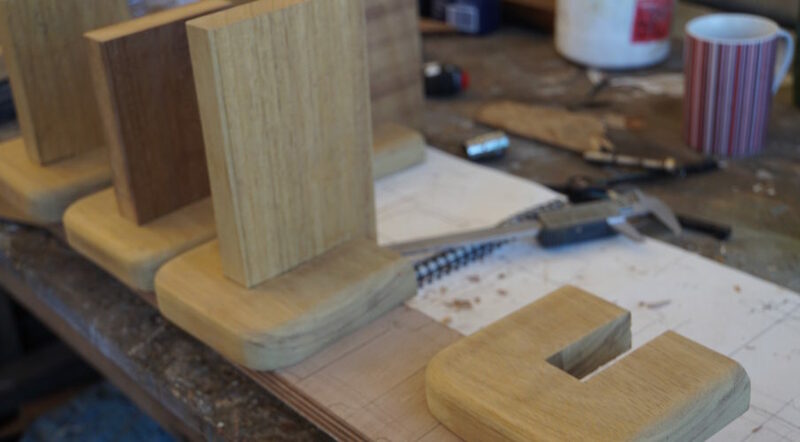 Time for the finishing touches! 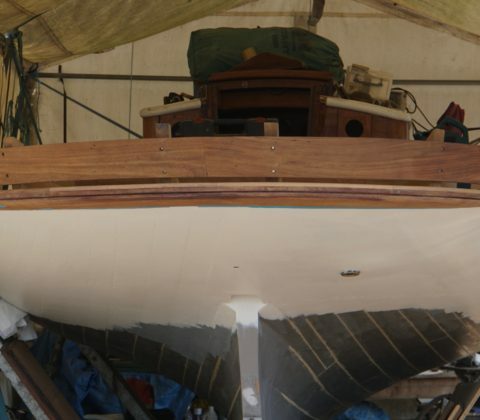 Last summer we promised to have her ready for the OGA August Classics this year, she won't be in the water but skippers and crews are all invited to visit during their sojourn at the Tidemill 23/24 August. 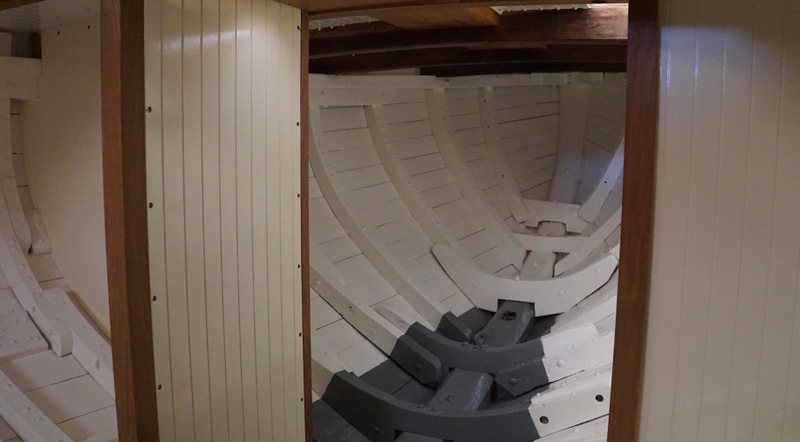 With the deck and hull all done, there's just the bulwarks before we can varnish and paint her for the winter. 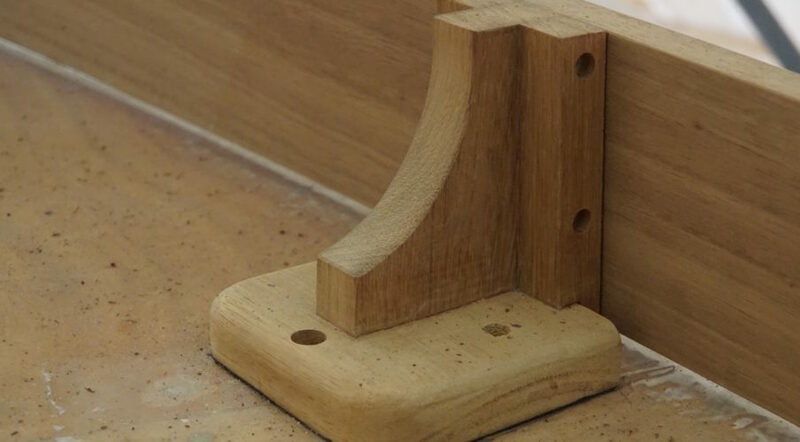 Steve starts with the reclaimed counter section, strong, laminated and possibly original. 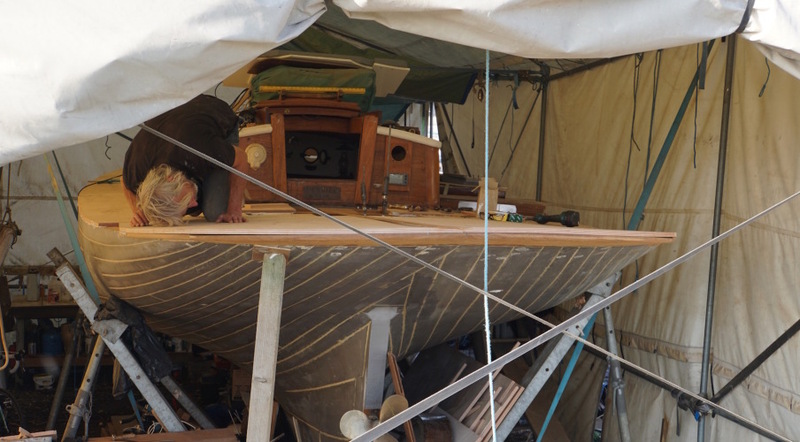 He makes a new set of knees to secure it firmly to the deck and makes good progress - it's great to see the counter restored (almost) to her former glory! 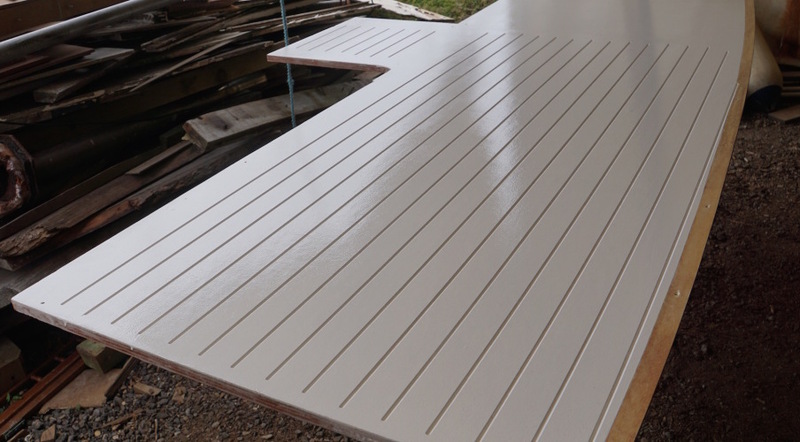 Finally, we’re laying the deck! The first week in August finds us back in Derbyshire for a few days, the house is still there and judging by the state of the garden, it’s been raining a lot! Return to Suffolk on the 10th with the intention of staying for the rest of the summer. We plan to do some house-hunting, following early research by Bev on her new road bike. 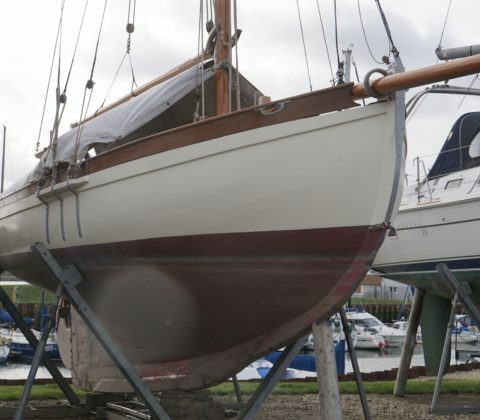 Beverley takes a week out to join James on 'Kestrel' in the August Classics, 14 - 23 this year while Steve is persuaded by Wendy that he must forgo sailing this summer and get on with the deck. 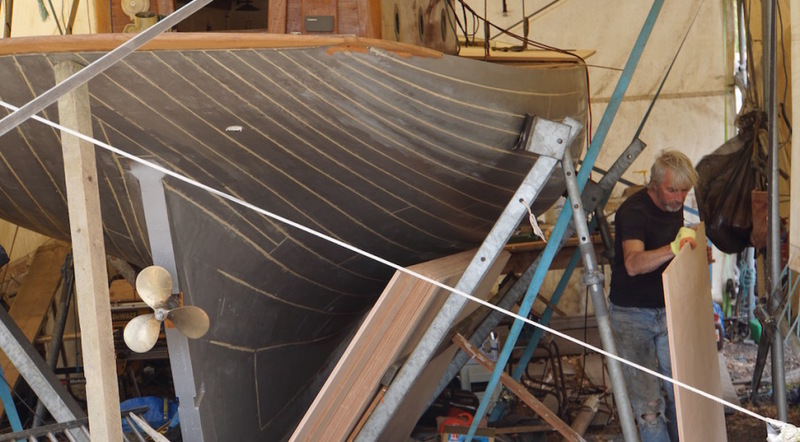 Did he really promise that 'Cachalot' will ready for the August Classics, 2016? 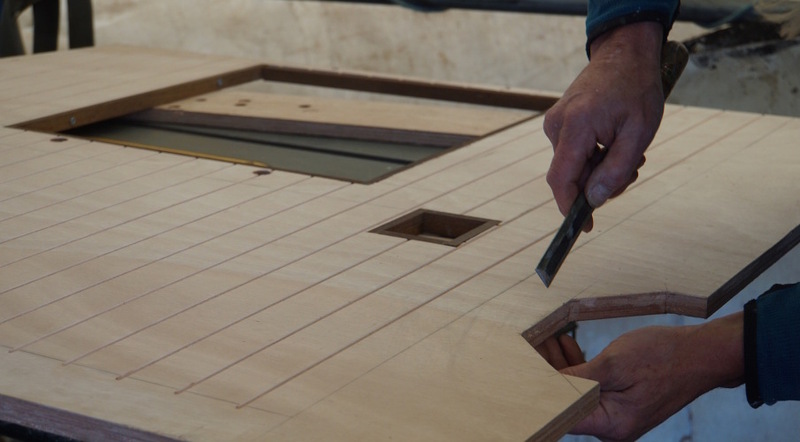 He gets started in earnest, making good progress by the end of the Cruise. But where's the summer gone? There's rain, rain, wind and more rain in the week up to the Bank Holiday, with a welcome invitation to dinner at the Masters on Bank Holiday Monday. Bev drives to Matlock for a couple of days to check out the house and visit her Mum. She gets a slow puncture in the car, which becomes a theme for the week with four on the bike back in Suffolk! It's a new tyre for the car and a tougher one for the bike after four inner tubes get holed! 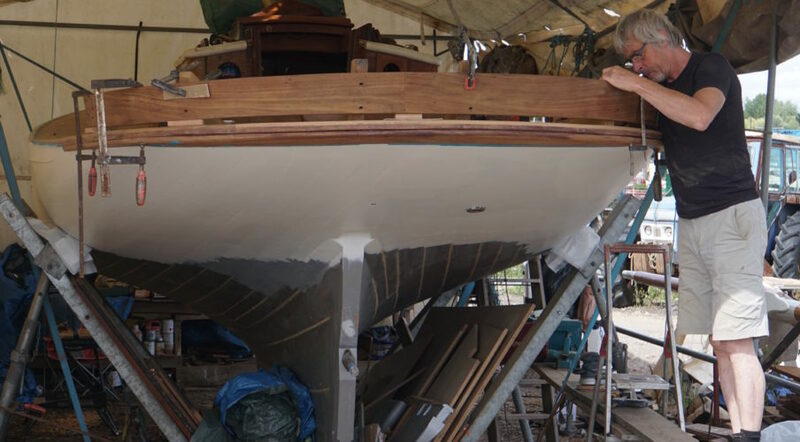 While Bev pedals round looking for houses, Steve continues to make great progress with the deck boards and bulkheads, all grooved and painted ready for fixing. 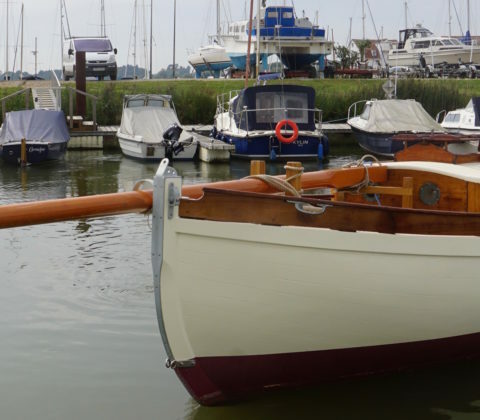 After another short trip back to Derbyshire, we put the house on the market and return for Maldon Town Regatta on 19 September. 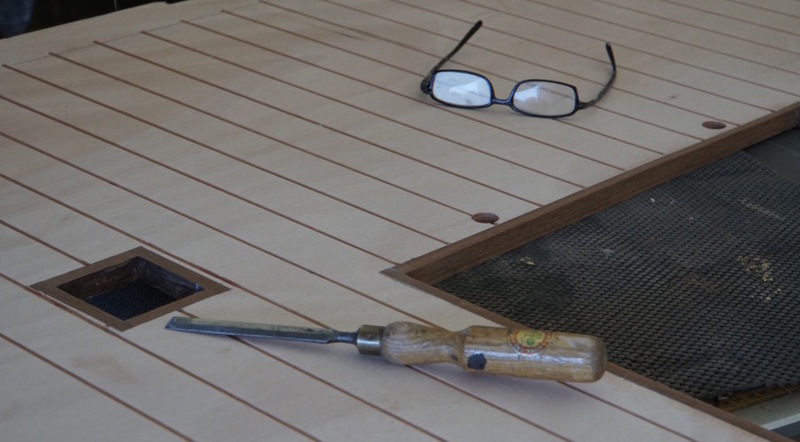 Autumn looks set fair for us to keep working on the deck into October, so we order 20 metres of glass with two-pack epoxy and put a thermometer on the coachroof to monitor temperature in preparation for glassing the deck. We join Simon and Julia for the Cycle Show at the NEC, and try out bikes way out of our price range! 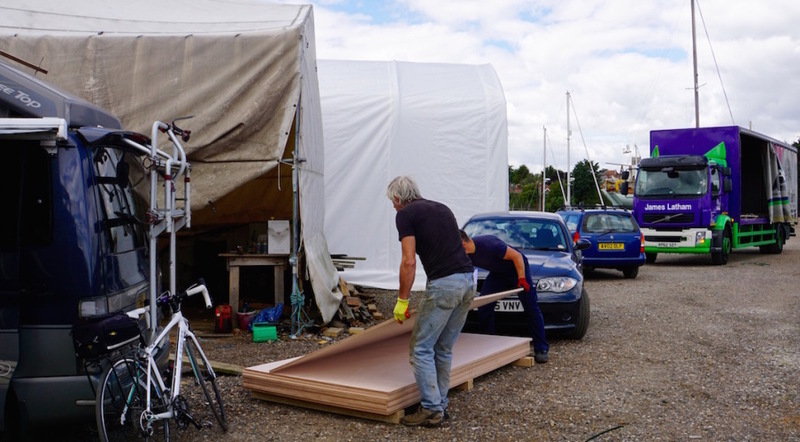 The final week of September finds Steve completing the preparation of the deck, and with bulkheads installed, we're ready for our lesson from James, kitted out in our very fetching protective clothing. 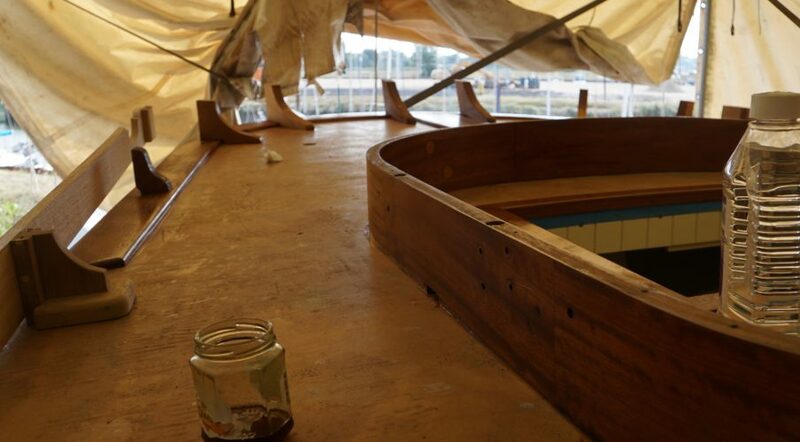 Everything has been carefully masked off, materials and tools all readily available, scaffold planks alongside the hull for fairly easy access and plans on how to glass the deck without getting ourselves into too many sticky corners! Bev is assigned as glue mixer, which is OK at first, but once there's only the two of us it becomes much more stressful . . . after four sessions, the job is done! 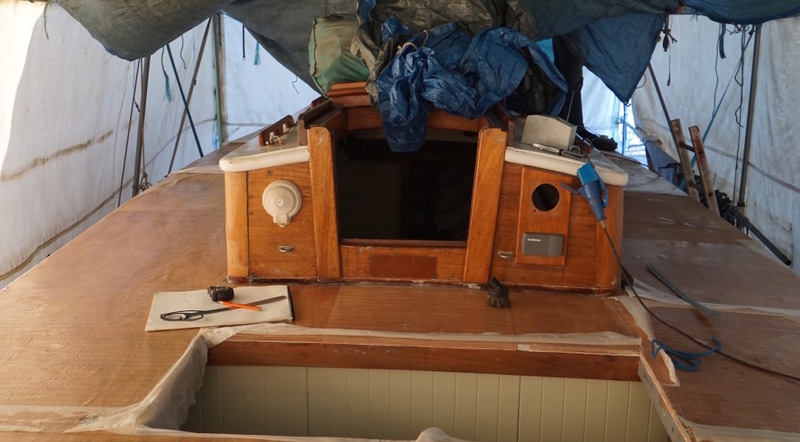 Painting the interior and preparing for the deck, at last! After being forced back to Derbyshire by gales at the beginning of May, we set off for sunnier climes in Italy. Travelling by train via Derby, London, Paris and Milan then to Siracusa, Sicily (with the train boarding the boat to cross the Strait of Messina), we returned by overnight ferry from Palermo to Naples, flying back to Gatwick after a few days sightseeing in Rome. 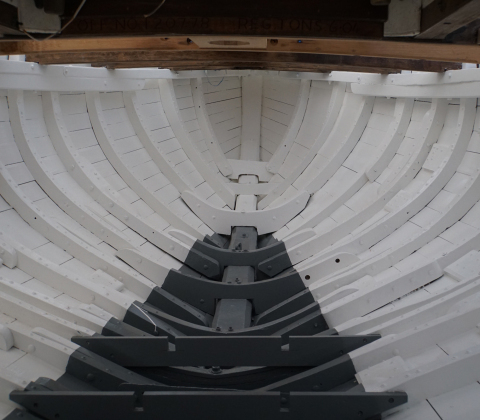 Progress having been seriously delayed this year, Steve spent just over a week in Woodbridge in early June, achieving his Springtime goal of getting the whole of the hull interior painted at last! 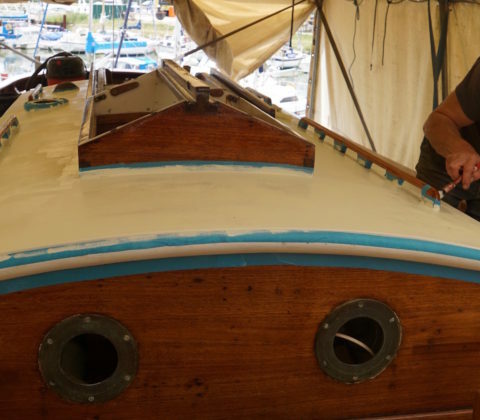 ‘Henry’, the hardy and generally trusted vacuum cleaner, did need the smile wiping from his face when he fell from a deck beam knocking a tin of (very expensive) paint into the bilges! 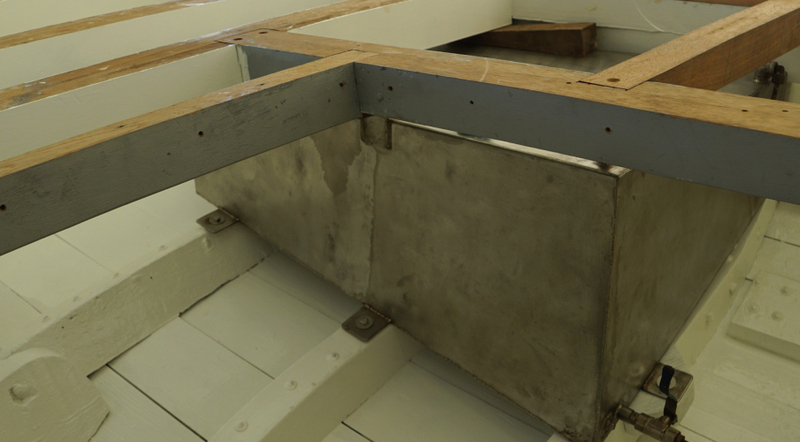 With grey bilges and white above the sole, she’s looking good, and another step towards putting on the deck. Mid-June found us back in Derbyshire for the Eroica Britannia at Bakewell Showground. Much colder than last year, the weather didn’t dampen our spirits as Beverley joined Steve and Rob for a most enjoyable (and challenging) 55 miles up hill and down dale along with 3,000 ‘heroic’ riders on classic pre-1987 bicycles. 4 July and it’s off to Suffolk again, taking the Bongo and the car for the ‘long haul’, with no distractions until August! 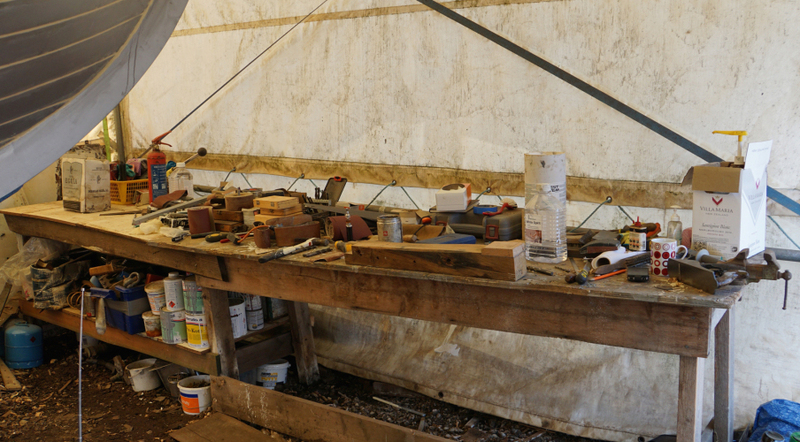 The tent's become somewhat untidy, leading to some ‘home improvements’, clearing out old wood that ‘might come in handy’ as patterns and extending the workbench to full-width of the tent: total cost, one bag of nails at £2.49!
. 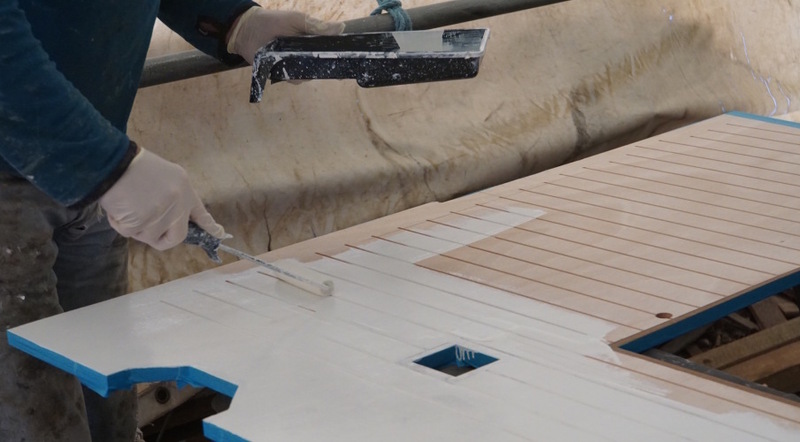 . . and now for the deck! 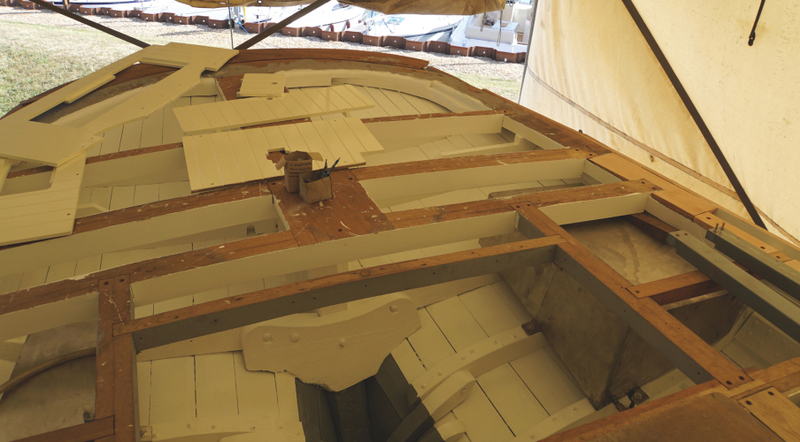 After more discussions, sucking of teeth and research into the definitive plan for the deck, it’s decided: marine ply and glass, painted to provide the look of canvas. 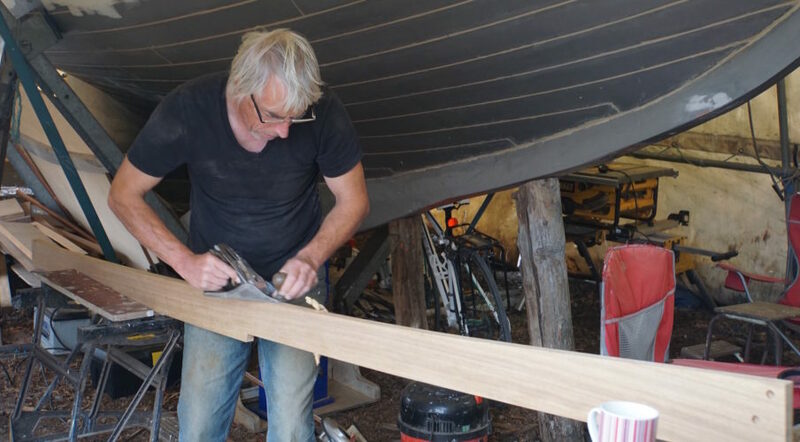 Now the decision's made, Steve's fairing the deck beams and finishing jobs it’s easier to do without the deck on, and ordering the ply, of course. 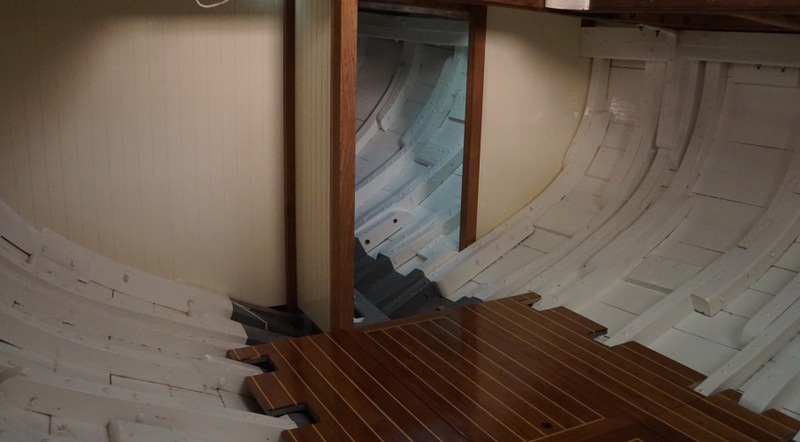 Water and fuel tanks are thoroughly cleaned, and securely installed along with a new fuel filter. 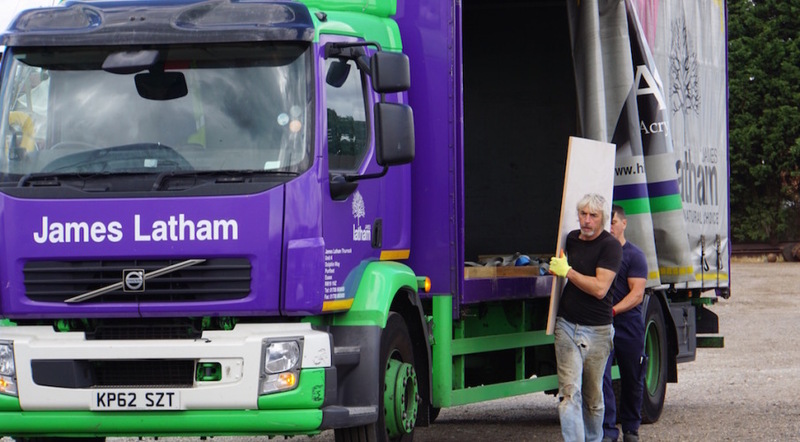 22 July: ten boards of plywood arrive on a large lorry from Lathams. After stacking it safely, we depart for Yarmouth, Isle of Wight for the weekend to say 'bon voyage' to the OGA fleet sailing to St Malo. 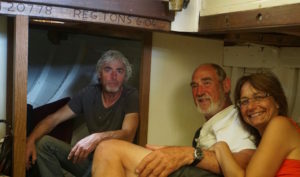 On our return, we find Marion and Ian are stormbound on 'Eleanor' in Ipswich, they cycled round to see the boat and invited us back for supper. 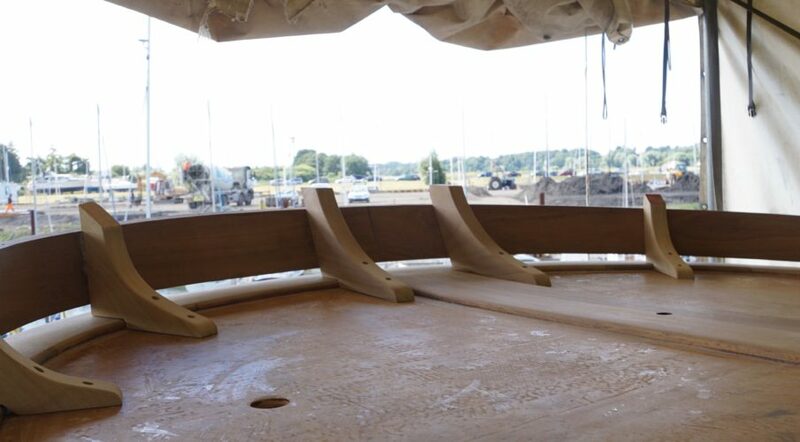 Yesterday, Trevor, Peter and Paul were in the Tidemill on 'Gromit', so we all repaired to The Anchor for an evening meal. 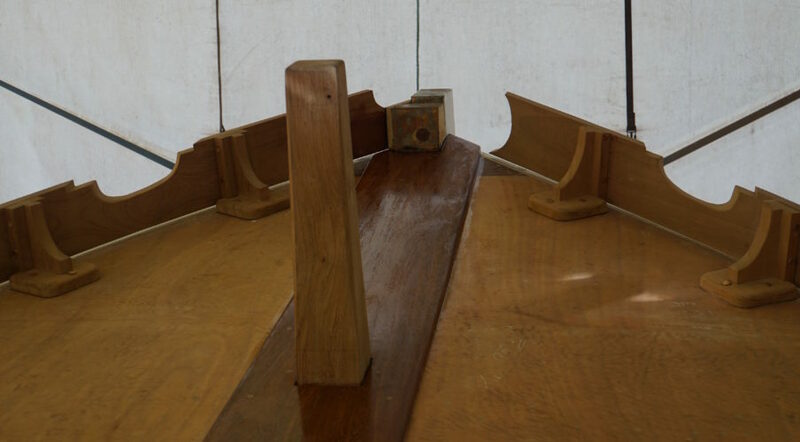 The last board . . .